Elisif the Fair is the Nord Jarl of Haafingar, reigning from the Imperial capital of Skyrim, Solitude. She is the widow of High King Torygg, and delegates most of her responsibilities to her steward, Falk Firebeard, on account of her mourning for her husband and political inexperience. 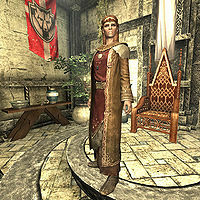 As Torygg's widow, she is also one of two claimants to the vacant throne of Skyrim itself, with the other being his killer, Jarl Ulfric Stormcloak of Eastmarch, whom Elisif understandably despises and unofficially competes with; although she is widely understood to have the Empire's backing as their preferred claimant, Elisif declines to formally declare her intentions until Ulfric's rebellion is crushed. Nonetheless, she fervently believes in her right to become High Queen of Skyrim. She has misgivings about entrusting the war effort to General Tullius, but doesn't see any other option. She is popular among her people, although some of her court have concerns about her age, inexperience, and her apparent subordination to General Tullius. Because of her inexperience, she can be quite overzealous in her desire to protect her people, with little regard for public resources. For example, when you first enter the Blue Palace, she can be seen promising a concerned citizen that she will send an entire detachment of soldiers to inspect a cave from which "strange noises" were reportedly coming. Her court advises her to instead send only one or two scouts, and to preserve their resources until they know exactly what they are up against. Elisif sleeps until 8:30am or so, and comes to sit at her throne around 9am, periodically leaving her court across the course of the day to dine in her quarters. If you conclude the civil war in favor of the Stormcloaks, she will be captured by them during the siege of Solitude. After General Tullius is killed, she is brought to the courtyard of Castle Dour, where Ulfric will address her during his victory speech, demanding that she renounce her support of the Empire and swear fealty to him instead. Surrounded by his troops, Elisif will have little choice but to agree, and once she does, Ulfric declares that she will remain jarl and departs. If you speak to Elisif later, it will quickly become apparent that although she is demoralized by the Legion's defeat, her opinion of Ulfric remains unchanged, and that she only supports him because with all of the cities under his control, and Imperial forces in Skyrim all but eliminated, she doesn't have the strength to challenge him. Thane Erikur, ever Elisif's detractor, will all but openly tell you that Elisif is now a puppet for Ulfric rather than General Tullius, and remains jarl purely at Ulfric's pleasure. If asked, Falk will speculate on Ulfric's reasons for leaving Elisif alive, admiring his political skill for managing to simultaneously be seen as magnanimous and compassionate in victory by sparing his fallen enemy's widow, and consolidating his victory by separating Elisif, and thereby Skyrim itself, from the Empire. Jarl Elisif the Fair: "Steward Falk, I have a task for you." Jarl Elisif the Fair: "I want to begin stockpiling food and water in the event we come under siege, and I would like you to oversee this work personally." Falk Firebeard: "A wise course of action, my Jarl. However, we have little food or water to spare." Falk Firebeard: "General Tullius does not run this city, Thane Erikur. Or have you forgotten your oaths of fealty?" Jarl Elisif the Fair: "There's no need for an apology, and you're right about the war." Jarl Elisif the Fair: "Perhaps this is a matter best discussed with the general in person." Falk Firebeard: "I will make the arrangements, my Jarl." Jarl Elisif was originally intended to be the target of a murder ordered by Boethiah, called Boethiah's Bidding, following the quest Boethiah's Calling. The quest itself was not implemented in the final game, but the data can still be found in the game files. Unused dialogue indicates that Erikur would have taken her place as Jarl of Solitude. This page was last modified on 24 January 2018, at 22:19.